Why did the Aztec God of the Sun demand human sacrifice? Tonatiuh (pronounced Toh-nah-tee-uh and meaning something like "He who goes forth shining") was the name of the Aztec sun god, and he was the patron of all Aztec warriors, especially of the important jaguar and eagle warrior orders. In terms of etymology, the name Tonatiuh came from the Aztec verb "tona", which means to shimmer, to shine, or to give off rays. The Aztec word for gold ("cuztic teocuitlatl") means "yellow divine excretions", taken by scholars as a direct reference to excretions of the solar deity. The Aztec sun deity had both positive and negative aspects. As a benevolent god, Tonatiuh provided the Aztec people (Mexica) and other living beings with warmth and fertility. In order to do so, however, he needed sacrificial victims. In some sources, Tonatiuh shared the role as high creator god with Ometeotl; but while Ometeotl represented the benign, fertility-related aspects of the creator, Tonatiuh held the militaristic and sacrificial aspects. He was the patron god of warriors, who fulfilled their duty to the god by capturing prisoners to sacrifice at one of several shrines through their empire. Tonatiuh and the sacrifices he demanded were part of the Aztec creation myth. The myth said that after the world had been dark for many years, the sun appeared in heaven for the first time but it refused to move. The dwellers had to sacrifice themselves and supply the sun with their hearts in order to propel the sun on its daily course. Tonatiuh governed the era under which the Aztecs lived, the era of the Fifth Sun. According to Aztec mythology, the world had passed through four ages, called Suns. The first era, or Sun, was governed by the god Tezcatlipoca, the second one by Quetzalcoatl, the third one by the rain god Tlaloc, and the fourth one by the goddess Chalchiuhtlicue. The current era, or fifth sun, was governed by Tonatiuh. According to the legend, during this age the world was characterized by maize eaters and no matter what else happened, the world would violently come to an end, through an earthquake. Heart sacrifice, ritual immolation by excision of the heart or Huey Teocalli in Aztec, was a ritual sacrifice to the heavenly fire, in which hearts were torn out of a war captive's chest. Heart sacrifice also initiated the alternation of night and day and of the rainy and dry seasons, so to keep the world continuing, the Aztecs waged war to capture sacrificial victims, particularly against Tlaxcallan. The war to gain sacrifices was called "water-burned fields" (atl tlachinolli), the "sacred war" or "flowery war". This conflict involved mock battles between Aztec and Tlaxcallan, in which the combatants were not killed in battle, but rather collected as prisoners destined for blood sacrifice. The warriors were members of the Quauhcalli or "Eagle House" and their patron saint was Tonatiuh; participants in these wars were known as the Tonatiuh Itlatocan or "men of the sun"
In the few surviving Aztec books known as codexes, Tonatiuh is illustrated wearing circular dangling earrings, a jewel-tipped nose bar and a blond wig. He wears a yellow headband decorated with jade rings, and he is often associated with an eagle, sometimes depicted in the codexes in conjunction with Tonatiuh in the act of grasping human hearts with its claws. Tonatiuh is frequently illustrated in the company of the solar disk: sometimes his head is set directly in the center of that disk. In the Borgia Codex, Tonatiuh's face is painted in vertical bars in two different shades of red. One of the most famous images of Tonatiuh is that represented on the face of the stone of Axayacatl, the famous Aztec calendar stone, or more properly Sun Stone. At the center of the stone, the face of Tonatiuh represents the current Aztec world, the Fifth Sun, whereas the surrounding symbols represent the calendric signs of the past four eras. On the stone, Tonatiuh's tongue is a sacrificial flint or obsidian knife protruding outwards. Klein CF. 1976. 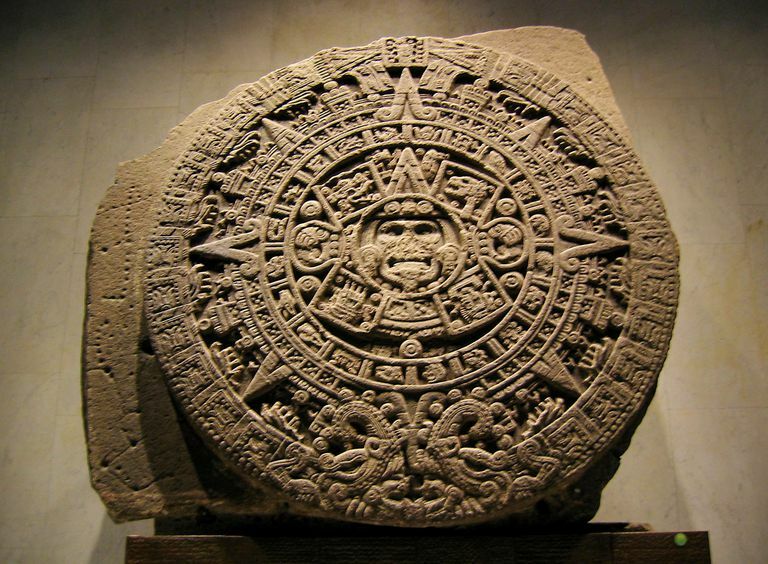 The Identity of the Central Deity on the Aztec Calendar Stone. The Art Bulletin 58(1):1-12. Mendoza RG. 1977. World view and the monolithic temples of Malinalco, Mexico: iconography and analogy in Pre-columbian architecture. Journal de la Société des Américanistes 64:63-80. Van Tuerenhout DR. 2005. The Aztecs. New Perspectives. 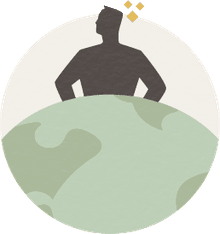 Santa Barbara, CA: ABC-CLIO Inc.